Although the mental health professions are effective in ameliorating personal distress, treatment can sometimes have negative consequences. The authors explore causal mechanisms for iatrogenic symptoms in therapy by discussing the process by which clients may be socialized into therapy and the potential impact that psychiatric labels and language may have in influencing clients' self-perceptions. The authors review research that has examined possible negative effects of psychiatric labels and then examine other forms of language, categorization, and conceptualizations that may contribute to negative effects in therapy. Iatrogenic symptoms may originate through the overreliance on a belief system within which therapists interpret, reinterperet or label clients' characteristics or distress as pathological. Therapeutic communication that emphasizes pejorative language may introduce clients to this belief system. Iatrogenic symptoms may also provide clients and therapists with secondary gains. Possible approaches for minimizing iatrogenic symptoms are explored. Boisvert, C. M., & Faust, D. (2002). 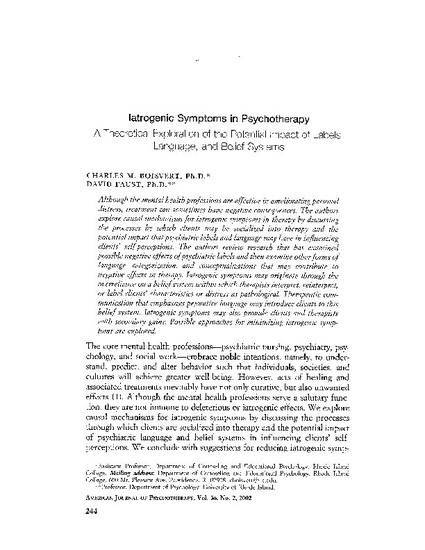 Iatrogenic symptoms in Psychotherapy: A theoretical exploration of the potential impact of labels, language, and belief systems. American Journal Of Psychotherapy, 56(2), 244-259.